The Frontier Barn Quilt Trail of Fulton County, PA founded in 2014 is a functioning division of the Fulton County Historical Society operating as a 501(c)3 organization. The Frontier Barn Quilt Trail of Fulton Co., PA consists of a private group of individuals functioning as a integral part of the Fulton County Historical Society who have come together to create a trail of barn quilts throughout Fulton Co., PA. The Mission of the group is to encourage a large community involvement to help in barn preservation, to celebrate our rural culture, pride in farm property and conservation, to educate youth and visitors on the value of the agricultural economy, to celebrate the quilting tradition, and to create a year round attraction that fosters other community events and projects. The project was designed to involve as many groups, individuals, youths and organizations as possible in an effort to assist in creating a trail of beautifully painted quilts throughout Fulton County. The development of the Frontier Barn Quilt Trail of Fulton Co., PA is serving as a preservation vehicle for aging agricultural structures. Barn quilt hosts have agreed to maintain their physical properties and structures as to assure a pleasing presentation to tourists and visitors for a minimum of three years. Also the participation of many of the barn quilt hosts are not only taking pride in their facilities but they are also taking pride in their landscaping and conservation practices. They realize their properties are becoming focal points of the community and they wish to take positive steps to project a positive natural and conservation image. 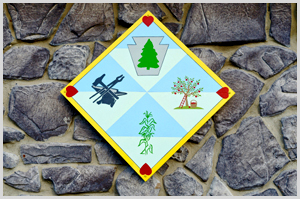 The development of the Frontier Barn Quilt Trail of Fulton Co., PA is serving as a recreational opportunity (i.e. : bus tour groups, bicyclers, tourist, motorcycle groups, Geo-cashers, etc.) as well as an economic improvement for our rural community. An additional recreation benefit of the barn quilt trail is the enthusiasm generated by the creativity and beautiful artwork that is being designed and painted throughout our county. Young and old, all are enjoying participating in this project because they see the beautification this project is bringing to our rural landscape. People are taking pride in their work, their properties and their facilities. There are additional benefits such as increased tourism, financial benefits for restaurants, shops, general and specialty stores, galleries, museums and lodging facilities. The quilt trail will serve as an attraction anchor for other events such as the annual Strawberry Festival, The Fulton Fall Folk Festival, and other community activities. The quilt trail will also provide for barn quilt trail calendars, cookbooks and historical publications. As a side benefit, this project will have a positive impact on our community without negatively impacting our rural lifestyle. The best way to describe the impact the Frontier Barn Quilt Trail of Fulton Co., PA has on our artistic and cultural heritage is to look at our Mission Statement. The Mission of the group is to encourage a large community involvement to help in barn preservation, to celebrate our rural culture, pride in farm property and conservation, to educate youth and visitors on the value of the agricultural economy, to celebrate the quilting tradition, and to create a year round attraction that fosters other community events and projects. What better way to celebrate and honor our artistic, cultural and historical heritage than to follow this mission? We have been very successful in meeting this mission and it is our goal to follow these principles throughout the life of the quilt trail however long that may be. Please respect the private properties where the barn quilts are displayed. Viewers are also advised to take all necessary safety precautions when viewing the quilts from roadways.